This new female outdoor lifestyle brand promotes empowered women who actively fish, hunt, hike, and shoot guns. Many people, brands, and organizations are noting the rise of women in fishing, hunting, and the shooting sports. Women are equal participants in the respective industries and will continue to join. One woman, Lauren Hill, has capitalized on this to create a unique and inviting brand for women, by women called ReelCamoGirl. 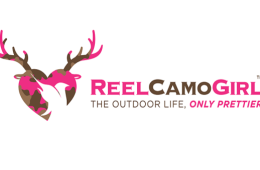 ReelCamoGirl is a lifestyle brand focused on ladies who love the outdoors.There is a growing need for a place for women to share their outdoor experiences, as well as an interest in clean eating and self-sufficiency. Through our website and social media networks, we offer a safe place where the ladies can share their pictures, stories, wild game and fish recipes, and news articles about conservation and hunting perspectives. Lauren Hill is a public relations professional who currently serves on the Board of Directors for Diego Safari Club International and Cornerstone Therapeutic Riding Center. She was kind enough to answer a few questions from us. Wide Open Spaces: Tell our readers about yourself. Did you grow up with the outdoors? What lead you to the outdoor industry? Lauren Hill: I love the outdoors. I have been fishing, free diving, hunting and shooting my whole life. I am the daughter of an avid hunter, oldest of seven siblings, wife of a Marine Corp Veteran and Police Officer, collegiate athlete and mother to three little girls. Growing up in San Diego we spent a lot of time outdoors. You can actually do this when the weather is nice all year round! We also did a ton of fishing and diving in the Florida Keys. Our family has a house there and for generations our family has been going there for fishing, spear fishing and lobster diving. Truly “Ocean Hunting” is my first love. I was proud of my ability to go get my food. It gave me confidence from a young age that I could do something that none of my friends could do. Since I can remember, we were taught to “Eat what you Catch/Hunt”. It has always felt very natural to know we were eating what we had worked hard to harvest as well as knowing it was clean and clear of hormones and antibiotics. I swell with pride when I look in our freezer and I see Lobster, Blue Fin, Grouper, Snapper, Whitetail, Elk, Sandbar, Salmon, Halibut, Moose, etc. I love knowing that either me, or someone in my family went and got that meat. We worked hard for it. It is clean, hormone and antibiotic-free and the animal lived a good free life. Besides fishing and lobstering we mostly hunted bird and small game when we were young. I did my first Black Bear hunt in Alaska with my Dad when I was 16. My father bought me my first gun when I was 12. After getting my undergraduate degree from John Carroll University in Cleveland I moved back to San Diego! I worked in professional sports for several years and after going back to school to get my MBA, took a job as Vice President of the Better Business Bureau where I stayed for 8 years. I left the BBB in March 2013 and started my own consulting company. I liked being at home and doing the consulting, however it wasn’t something I had a passion for. In 2015 I created ReelCamoGirl as a way to help fill a need to work on something I was passionate about. I noticed that women and girls really didn’t have a “safe” place to go to be able to share their stories, photos and adventures in a community away from the antis and haters. I also felt it important to have a platform where we could talk about conversation, sustainability and try to dispel common myths about hunting and hunters. I’m honored to continue protecting our freedom to hunt, supporting wildlife conservation and sustainability, and helping people fulfill their goals. What is ReelCamo and ReelCamoGirl? What are the goals of your brand? How will it appeal to hunters, anglers, and gun enthusiasts? ReelCamoGirl is a lifestyle brand focused on championing ladies who love to hunt, fish, hike, shoot, dive, etc. ReelCamoGirl offers a (safe) place, through website and social media where people can connect and share their pictures, stories, recipes, etc. without fear of being attacked. ReelCamoGirls are strong, capable, kind, compassionate, nature & country-loving individuals. We encourage responsible and ethical hunting. We care about the land and wildlife management and about long term sustainability. We hunt, fish, dive, shoot and hike…for peace of mind, happiness, pure clean protein & connection to the outdoors. ReelCamoGirls can shoot a gun, draw a bow, track an animal, get CAMOed up, bait a hook, clean a fish and still be feminine. I think the brand has appeal to both men and women. We have lots of men who are very encouraging to the ladies of ReelCamoGirl. Some men are fathers with daughters, some just really see the importance to getting women to enjoy outdoor activities. Men, women, moms and dads are all responsible for the next generation of outdoorsmen. If we can encourage more people to get involved in outdoor activities whether it is hunting, fishing, hiking, shooting, diving, etc. we may be able to continue to protect this way of life we hold dear. ReelCamo is a unique camo pattern that incorporates fishing images into traditional camouflage. ReelCamo is a product of ReelCamoGirl. We are currently working on several clothing pieces featuring our fun pattern! What advice do you have for new anglers and hunters? You have to be willing to jump in and try stuff. Find someone you know who likes to hunt, fish, shoot, etc. Usually they are thrilled to hear you are interested and will be willing to help you with basics or take you along. There are some basics that you should look up first such as signing up for your local Hunters Safety course. Many shooting ranges offer a beginners course, so don’t be afraid to give them a call. Get involved with ReelCamoGirl! We have grown a great community of women and men who are absolutely willing to answer questions you might have. Most everyone has some sort of Social Media account. ReelCamoGirl can be found on Facebook, Instagram, Twitter and our Blog and Website. Get on and start asking questions you will get answers! Newbies should be ready to be surprised how much they ENJOY the outdoors. What most people don’t realize is that hunting and fishing is so much more than just the kill. It’s being at peace in the outdoors. Enjoying nature and being outdoors is very therapeutic. This is a brand many females, myself included, can get behind. Follow ReelCamoGirl on Instagram, Twitter, and Facebook!